Oct. 24, 2017 - Nestled in between the forests of Kenora, Ont. 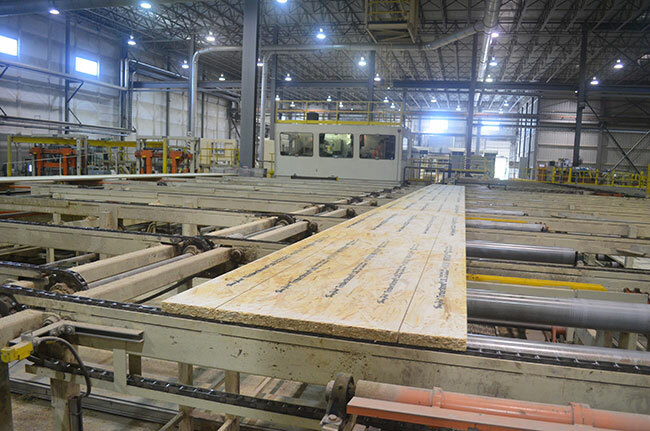 is Weyerhaeuser’s Kenora TimberStrand, a 10.5-acre engineered wood products facility that resides on a 65-hectare site. 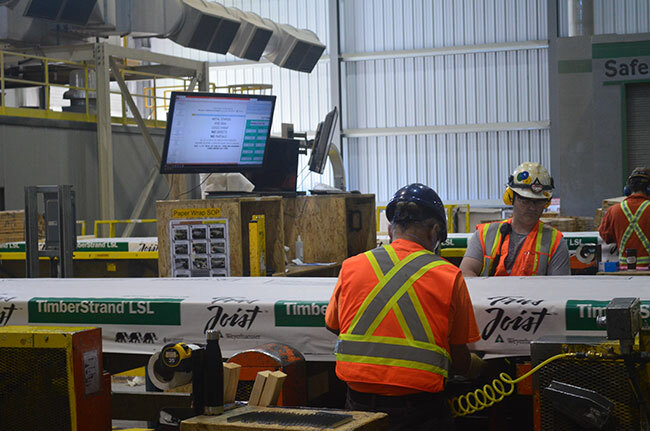 This plant is the base of operations for the production of the company’s TimberStrand Laminated Strand Lumber (LSL) products, which include wall framing, rimboard, concrete forms, columns and headers and beams. The products are produced in lengths up to 64 feet and thicknesses anywhere between 1” and 3.55”. These engineered wood products are mainly shipped south of the border to supply the U.S. homebuilding market – although Weyerhaeuser also supplies the product to the Canadian and Japanese homebuilding markets. The TimberStrand LSL products are a popular choice for homebuilders due to their ability to resist splitting and checking on the ends, as well as its resistance to bowing, twisting and shrinking. The LSL beams are able to accommodate large holes for plumbing, wiring and conduits – upwards of 4-5/8” in a 14” beam – without hindering its structural performance. The strands in the LSL products are aligned in one direction as a method to maximize the wood’s natural strengths. The impressive plant employs 200 associates that work across four shifts that keep the facility operating 24/7. “It’s definitely one of the biggest employers in the area,” Wallace says. One of the ways that the plant ensures the consistency of its LSL products is through the use of an ultrasonic blow detector and thickness gauge systems, supplied by Airstar, a California-based engineering company. The plant started out with a blow detector to ensure its products met the necessary bonding specifications, and later added a four-channel laser thickness gauges on the outfeed of the sander and an eight-channel laser thickness gauge on the outfeed of the press. One of the advantages of the Airstar system is the support offered by the supplier to help navigate any issues that come up with the equipment. An ultrasonic blow detector and thickness gauge systems supplied by Airstar help the plant ensure the consistency of its LSL products. The LSL produced on site is created from a combination of aspen and birch trees, with about 90 per cent of the species used being aspen. After logs come into the yard they are placed in conditioning vats for several hours to soften the fibres. They are then placed on conveyors, run through metal detectors and sent through one of the plant’s two A5B Nicholson debarkers. After being debarked, the logs are broken down via one of the plants two Pallmann stranders into very specific strand dimensions. 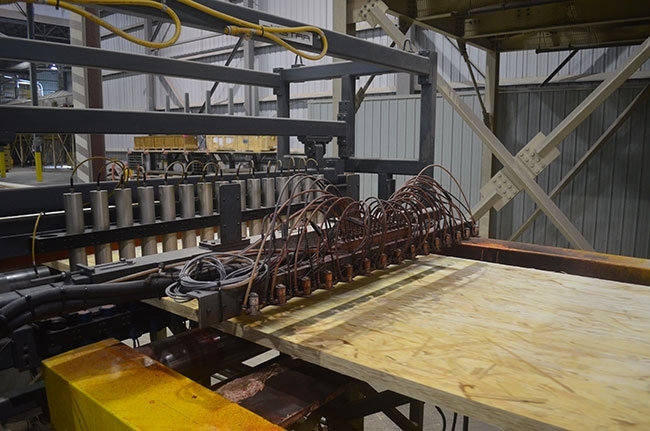 Those strands are then conveyed to an area where they are blended with MDI resins before being fed into a steam-injected, single-opening press where they are pressed into large billets weighing upwards of 7,300 lb. Once pressed, the billets are scanned by the Airstar eight-channel laser thickness gauge to ensure they are within specifications before being sent to a cooling system. After they are cooled the billets are sent through an Imeas Sander. The Airstar four-channel laser thickness gauge on the outfeed of the sander then checks the wood product to make sure they are still meeting thickness specifications. The billets then pass through the Airstar ultrasonic blow detector to be scanned for bond integrity and if a defect is detected, the system will automatically reject that material. The sanded billets are then cut to multiple widths using a Mereen-Johnson rip saw and then sent to the end of the products line where they are strapped, cut to length, wrapped and stored for future shipping. When asked about some the Kenora plant’s more challenging times since pressing its first billet in the fall of 2002, Wallace recalls the downturn in the U.S. homebuilding market. “It was pretty touch-and-go for a while,” he says. That said, Weyerhaeuser never permanently shut down the mill during those times and continued to run the plant (although not a full capacity) until it rode out the storm. As far as present challenges go, Wallace focuses on continuing to optimize processes at the plant.